After the 22 February 2011 Christchurch earthquake, GNS Science installed continuous GPS (cGPS), water-level, and rainfall monitoring equipment on selected landslides in the Port Hills suburbs of Christchurch. 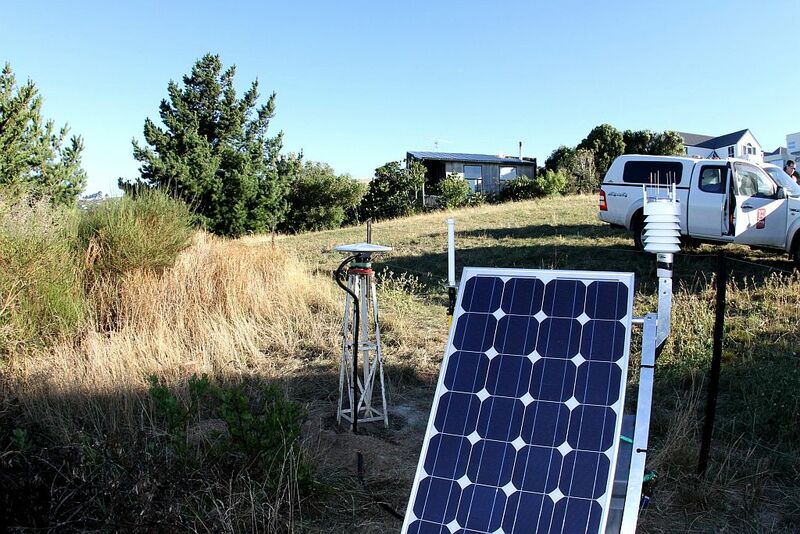 A cGPS installation together with the weather station set-up at Sumner. Another typical cGPS installation in the Port Hills. The purpose of the monitoring is to provide data for research into the post-earthquake performance of these landslides. The equipment is not maintained to provide an automated hazard warning. 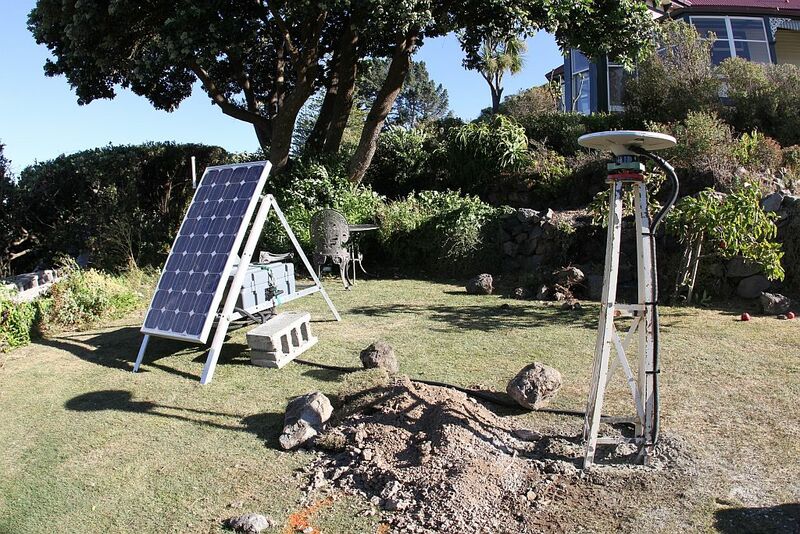 Installation and monitoring of the sites is carried out under the GeoNet project. The monitoring data are freely available to anyone via the links below. Surface movement is monitored by continuous GPS equipment (cGPS). At each site, a cGPS antenna is mounted on short steel towers cemented into the ground. Water pore pressure is being monitored down 6 boreholes using 'vented Druck' pressure sensors. The equipment is powered by batteries with solar recharge. The collected data are sent via the mobile phone network to the GeoNet Data Centre in Lower Hutt. Monitoring of these sites does not mean that continuing movement is necessarily expected to occur. However, if future movement of these sites were to occur, then the information from the monitoring would be useful to assess what factors may have contributed to the movement. These factors typically include rainfall and/or further earthquakes. The cGPS instruments solve for the antennae position, comprising an easting, northing, and vertical component each 30 seconds; positions are averaged over a 24-hour period to give an average daily position. These daily positions are filtered relative to another cGPS located on Banks Peninsula (site code MQZG at McQueen's Valley), which has been assessed as being on stable ground. The purpose of the filtering is to remove regional movement patterns such as those related to normal tectonic plate motion. However this filtering may not eliminate all of the regional deformation associated with post-February 22 tectonic adjustments. The movement data of the cGPS sites can be viewed using FITS. The water pressures in the monitored boreholes are being recorded at 5-minute intervals. Water levels are subsequently obtained. No barometric corrections are applied to these data. Water level depths are recorded as the height of the water column above the sensor tip. Where do I find the data?